Back in the 1930s a blockbuster movie was made which reappears almost every year on the Christmas TV schedule. It tells the tale, which is in fact a true story, about a famous mutiny that took place in 1789 on an English ship. The exact cause of the mutiny is unclear, but the captain’s harsh and brutal treatment of his men has been offered as a possible explanation; that said, conditions on-board ships in those days were very hard. The ship was HMS Bounty and the captain, one William Bligh. William Bligh was born in Plymouth on September 9th 1754, and joined the Navy as young man aged 15. He had a ‘colourful’ career, and was personally selected by Captain James Cook to be the sailing master of the Resolution on his second voyage around the world between 1772-74. He saw service in many naval battles, in 1781 and 1782, and in late 1787 he was chosen by Sir Joseph Banks to command HMS Bounty. To the men of the Bounty Bligh was a harsh and cruel taskmaster, and chief mate Fletcher Christian became, as did other members of the crew, increasingly mutinous over the course of their journey. The Bounty had orders to collect breadfruit trees from Tahiti, and take them to the West Indies as a food source for the African slaves there. Tahiti was a beautiful place and when the time came to leave the island, the crew were understandably reluctant to say their goodbyes. For it appears that the crew had been beguiled by the charms of the Tahitian women, (apparently Tahiti is not called the Friendly Island for nothing), which made the harsh conditions of the Bounty doubly difficult to stomach. In April 1789, a mutiny involving many of the sailors took place; their ringleader was Fletcher Christian. The result of this was that Captain Bligh and eighteen of his loyal crewmembers were put in an open boat, and set adrift in the Pacific by the mutineers. He may have been a tyrant on-board ship but Captain Bligh was a brilliant seaman. After a journey of almost 4,000 miles in an open boat, Bligh brought his men safely to shore in Timor in the East Indies, quite a staggering feat of navigation considering that they had been set adrift without charts. It is not known what happened to the ship Bounty after the mutineers reached Pitcairn Island in the South Pacific in 1790. It is known however, that a little later some of the mutineers returned to Tahiti and were captured and punished for their crime. The ones that stayed on Pitcairn Island formed a small colony and remained free under the leadership of John Adams. It is not clear what happened to Fletcher Christian. It is thought that he, along with three of the other mutineers, may have been killed by the Tahitians. Meanwhile Captain Bligh prospered, and in 1805 he was appointed Governor of New South Wales in Australia. However his strict discipline again proved difficult for people to accept, and his policy of preventing the importation of liquor provoked the ‘Rum Rebellion’: yet another mutiny then! Bligh was arrested, this time by mutinous soldiers, and kept in custody until February 1809 before being sent back to England in May 1810. Not that this ended his illustrious career; he was made an Admiral in 1814. He died on December 7th 1817 at his London home. 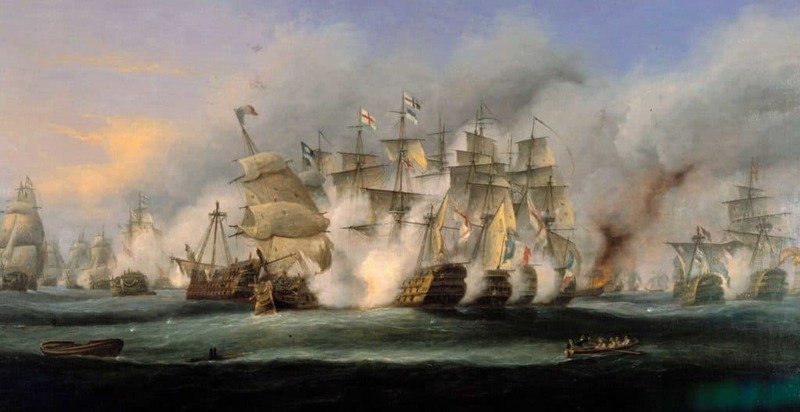 The list of British Naval heroes is a long and illustrious one, including the likes of Drake, Nelson, Rodney, Hood and of course Thomas Cochrane. Thomas who, you may ask? Based on the site where the Lloyd’s building is today, East India House was the headquarters of the largest and most powerful company that the world has ever seen…The East India Company.